Exercise and sports science concentrates on the integration of exercise and physical activity into health care, sports performance, disease prevention and rehabilitation. This discipline focuses on all aspects of the study of human movement and development and incorporates clinical practice instruction, practicums, and case studies to provide the advanced skills and experience essential for professional practice. 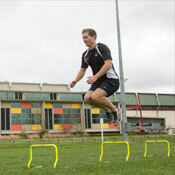 You'll learn about the fundamentals of sport and exercise through units about anatomy, biomechanics, physiology, exercise prescription and programming and sports psychology. You'll also undertake 140 hours of workplace experience. With small class sizes, studying for the Bachelor of Clinical Exercise Physiology provides an opportunity to study the scientific basis of sport and exercise and its effect on both healthy individuals and those with chronic and complex health conditions. 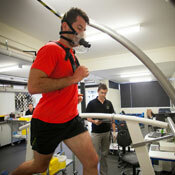 Where can you go with a pathway in Exercise and Sports Science? Graduates from our undergraduate degrees are competitively positioned for exciting careers within the field of exercise and sports science. For more careers information within the field of exercise and sport science within Australia, please look at the ESSA Careers Guide.